GridView control is used to display whole table data on web page. In GridView control each column define a filed or title, while each rows represents a record or data. The GridView control dipaly data with rows and columns wise, we can display whole table in GridView and we also display only required columns from table in GridView control in asp.net. In GridView control we can easily do sorting, paging and inline editing. Also we can perform editing and deleting operation on displayed data with GridView control. Now let’s take an asp.net example to bind data in to GridView. Here, we learn how to bind and diaplay data in GridView control from sql server database in asp.net c#. Step 1 – Open the Visual Studio –> Create a new empty Web application. Step 2 – Create a New web page. Step 3 – Drag and drop GridView Control on web page from toolbox. Step 5 – Make connection between Database and web application. 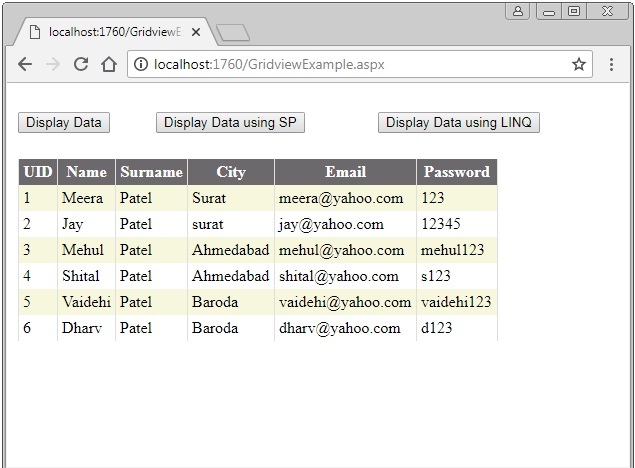 In this asp.net example we will bind data to GridView from SQL server database. So, we need to do connection between our web application and sql server database. There are several method for make connection, we will explain three different connection method in our example. Bind Data using LINQ method. Design asp.net web form with GridView control along with three button as show s in below figure. First add namespace on code page. Now, write below code on ‘Display Data’ button. This connection method we use SQLConnection and SQLDataAdapter object and write sql query in code behind page. This sql connection method are basic connection method. Write below code on ‘Display Data using SP’ Button. In this method we use DataSet and SQL Stored Procedure for sql connection. Use Table Adapter instead of DataAdapter. Write below code on ‘Display Data using LINQ’ button. 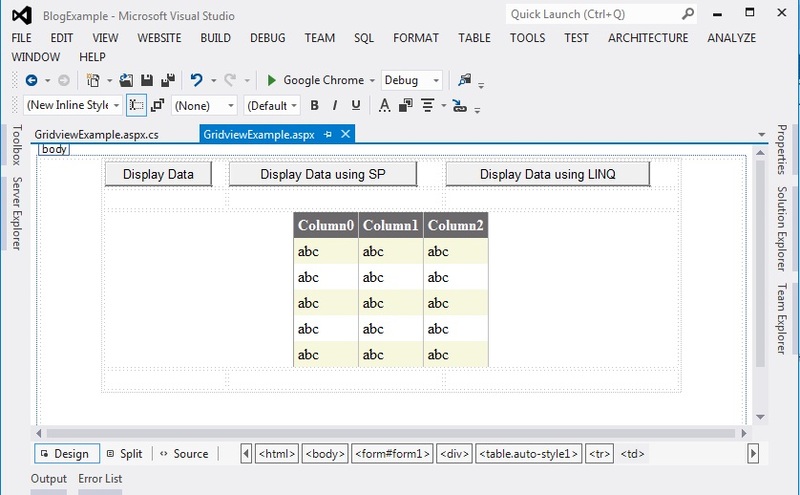 Here, we use LINQ method to fetch data from sql server and Display data in to GridView control. Here is the result of above GridView example. Full code of code behind page C# code. In our next asp.net tutorial we will learn more about GridView Control.